Eliot Porter was to color photography what Ansel Adams was to black-and-white. 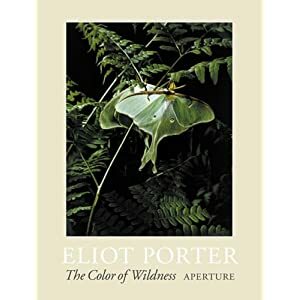 The jacket flap of one his books published in 1970 simply stated “Eliot Porter is recognized as the finest color photographer alive today”. It can be argued that Porter was not only the first color nature photographer, but also the first major artist working in the medium of color photography, a decade before “early colorists” Saul Leiter and Fred Herzog, and more than two decades before William Eggleston. Books of color photography are nowadays omnipresent, but it was not always so. There was a first, and it was Eliot Porter who lead the way in 1962 with “In Wildness”, the pioneering “coffee table” book. It has since then spawned an entire industry which also includes nature posters and greeting cards. Its success led him to eventually publish more than 25 books. At the time of his death, in 1990, in terms of publications, public and institutional acclaim, influence on other photographers and on the environmental movement, Porter stood apart. Yet, for reasons I am not sure, in the 21st century, Porter’s reputation seems to have faded to the point that none of his books remain in print, as of this writing. However “In Wildness” is coming back soon, and a new catalog from the Getty Museum, Eliot Porter: In the Realm of Nature is announced for this fall. Fortunately, so many of his books were sold that most titles can readily be found on used-books websites at prices that are a bargain. In the 1940s, Porter began a personal project to photograph forests, ponds, leaves, and wildflowers in the Eastern woods, introducing a more intimate window on nature, in color and soft hues, in which he looked for the transcendental as he was reading Thoreau at the suggestion of his wife. When David Brower accepted the proposal from Porter to publish the project as his first book, the Sierra Club did not skimp on its production. Raising $40,000 ($300,000 in today’s currency), they printed out a large (10×13) and heavy book – part of the “exhibit format series” which had started with “This is American Earth”, possibly Ansel Adams most important and famous book. “In Wildness” consisted of 72 large format color photographs of the New England woods, reproduced as well as they could be at that time, using four-color lithography and a special varnish only on the photo pages which used Kromekote paper. Each of them is cleanly paired with a quotation from Henry David Thoreau – printed on the left opposite page and served by great typography – which matches the image in spirit. First published in 1962, the book was an instant sensation, selling close to 60,000 copies – more than “This is American Earth”. To understand the magnitude of this success, notice that the cost of the book was $25. This is $188 in 2012 currency. The book revolutionized the publishing industry by setting new standards for designing and printing fine art photography books, and proving that there was a market for them. It earned the Sierra Club an international reputation as a publisher of fine books, and helped expend their audience (for a thorough exposition, see the book chapter The Sierra Club and Coffee Table books). Published in the same year as Rachel Carson’s “Silent Spring”, and delivering a complementary message, the book had a lasting effect on the nascent conservation movement. Besides establishing Porter’s reputation as the pioneer of color photography, and effectively launching his career, the public’s positive response to “In Wildness” showed him that he could use photography to make people aware of nature’s beauty without compromising his artistic goals. This transformed him into an active conservationist. “In Wildness” would remain in print for decades. According to the Amnon Carter Museum, more than one million copies were sold. I remember purchasing a used copy in the first month after I moved to Berkeley in 1993, and keeping it at my bedside for weeks, as I found it incredibly inspiring, even with the diminished power of the paperback edition. Porter’s images showed to me that beauty could be found in the most humble scenes, and revealed by a honest representation without excessive effects. I eventually bought a copy of the first hardcover edition, which is more satisfactory with its large size and more vivid reproductions. Yet, there is no doubt that book printing has improved considerably since then. Comparing side by side, the reproduction of the original cover image (“Pool in a Brook, Brook Pond, New Hampshire, October 4, 1953”) looks better in Intimate Landscapes (1979) and Eliot Porter (1987). With that in mind, I had good hopes for the 50th anniversary edition released by Ammo books in Nov 2012, but didn’t purchase a copy after seeing that Michael Johnston and Geoff Wittig gave it a thumbs down: “In comparison with the original first edition, which I have, the reproduction in the reissue looks like bad color Xeroxes”. The link at the top of this entry points to the first 1962 edition, which is somehow difficult to locate amongst all the amazon links for various editions. Unlike his first one, the second book of Eliot Porter was to be part of an environmental campaign – to stop construction of the Glen Canyon Dam. Unlike the gentle woods were Porter spent much of his early years, it depicts the more striking and harsh geology of the Southwest where Porter would live for the second half of his life after his move to Santa Fe. This setting, and the stronger light yields some of Porter’s most colorful and abstracted photographs. The influential conservation photographer Robert Glenn Ketchum considers this work to be the pinnacle of Porter’s career, because “he was free in those canyons to give service to his science and his documentation and still be in abstraction heaven”. The book is all the more precious because it is an eulogy. It came too late to affect public opinion and prevent the flooding, although it did result in federal review of reclamation projects on western rivers and the eventual passage of the Wilderness Act in 1964. Therefore, when looking at the vibrantly colored photographs of gulches, rock walls, and hidden canyons carved by the Colorado and San Juan Rivers, one cannot help remembering that those treasures would never be seen again. The book design – by David Brower himself – and format are identical to “In Wildness”, making it almost a companion volume. The design used in the Sierra Club Exhibit series has varied over the years, but all the Porter books in the series present images with adequate white margins, consistent placement, and no gutter overlap, although the print quality appears to have degraded over the years. A compelling writer who would often share the circumstances of his photography adventures and educate about their subjects, Porter wrote the text in the opening and concluding pages. He selected the quotations facing the photos from a variety of writers to face the photos instead of just one. This is the most personal of all Porter’s books. His father had bought Great Spruce Head Island, accessible by an hour boat ride in the Penobscot Bay of Maine, where “there was nothing anywhere that was unnecessary; nothing; whether the work of man or nature that existed without a purpose”. The summers that he spent there were the source of his love of nature and photography. The book is divided in two equal parts. In the first part, autobiographical texts are mixed with early black and white photographs of Penobscot Bay. The second part, in the spirit of the two first Porter Books, consists of color photographs in Porter’s mature style, mixed with short literary quotations from more than a dozen of authors. Published in 1966, this was the third book by Porter in the Sierra Club Exhibit series. 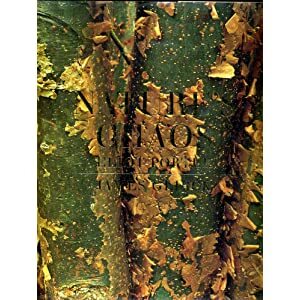 Twenty years later, in 1986, Porter revisted the place closest to his heart by compiling unpublished images into a new book Maine where he lets the photography do all the speaking – there is little text besides a short opening autobiographical essay – in a clean NYGS/Eleanor Caponigro design. Maine and the Eastern forests were Porter’s first stomping grounds. He then explored extensively the Southwest where he relocated, but his sense of adventure led Porter to expend his horizons to exotic locales as diverse as Baja California, the Galapagos, Africa, Greece, and China, each trip resulting in a book. But none location was as remote as Antarctica, which he visited on two trips in 1974 and 1975. At that time, no commercial trips were available, but Porter had been selected as an artist-in-residence by the National Science Foundation, which provided him transportation and logistics that allowed him to work in a large array of locations for several months. The book consists of an extensive travelogue supported by maps. In between written chapters, there are six photo sections which illustrate diverse aspects of Antarctica, including wildlife as well as landscapes – both ground and aerials – and even historic settlements. Porter was remarkably fit for his age, however he was 74 during those expeditions. Because of the difficult working conditions, he used a 35mm camera for much of this work, which sometimes compromised a bit the quality of reproduction compared with his older books, although in most cases with his later books, the printing was too contrasty. Porter had been photographing birds since his early years, but in 1939 a publisher rejected his bird book proposal because he thought that color was essential for bird identification. This was the impetus that prompted Porter to take up of the challenge of color photography. To fully appreciate it, remember that Porter was working with a 4×5 camera, a few feet from some birds, and the speed of the initial Kodachrome was a ridiculously low ISO 5. With the support of a Guggenheim grant, using custom lighting equipment and building towers, Porter was able to make color bird pictures which were good enough to be the subject of a solo exhibit at the Museum of Modern Art, New York, in 1943. Those are far more interesting than the visual simple contemporary bird photographs with a blurred background captured with AF, super-teles, and fast frame rates, and high ISO. Instead, Porter portrays the birds at close-range, in their natural nesting environment with exquisite colors and textures revealed by great resolution and depth of field. Despite artistic recognition, the book had to wait because of the high cost of color quality color reproduction. It wasn’t until 1972, long after gaining success with his non-bird photographs, that Porter would publish that book about his first photographic love. It consists of a five-chapter narrative about his time in the field as a caring bird photographer, (“the steps necessary to safeguard the welfare and even the lifes of the subjects may take up more time than the photography itself”) mixed with seven groups of full-page photos – 64 in color, 16 in black and white. 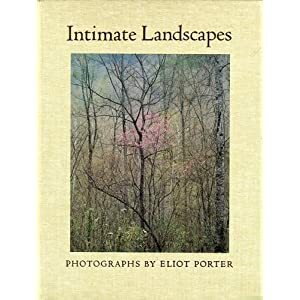 In 1979 the work of Eliot Porter was exhibited in Intimate Landscapes, the first one-person show of color photography at The Metropolitan Museum of Art, New York. This exhibition earned Porter praise as the individual who brought credibility to color photography as a medium of fine art. The image selection defined what is now meant by the term “intimate landscape”: the close-range, quiet compositions of natural elements with muted colors and dense textures, meditative and dense with layered meanings, which were the hallmark of Porter’s work at the exclusion of more expansive and spectacular landscapes. The book is the catalog of this landmark exhibition, well printed (although maybe too muted) and flawlessly designed by Eleanor Morris Caponigro in an understated way which fits perfectly the work. Curator Weston Naef authors one of the first essays on Porter, describing him as “captivated by colors that had not yet been named”. Except for a few, all the images are in vertical orientation, therefore fitting the format of the book well. Unlike others, this book has become collectible, with no reprints available, so there are no inexpensive copies. Long before bursting on the scene with the color photographs of “In Wildness” in 1962, Porter had become a recognized black and white photographer through a body of work which is now mostly forgotten. His black and white photographs were exhibited at Steiglitz “An American Place” art gallery in 1938 – not an insignificant honor since Ansel Adams and Paul Strand were the only other photographers represented there -, prompting him to leave science and devote himself to photography full-time. In 1980, Janet Russek who Porter had hired to help catalog his photographs, came across boxes of pictures that she did not recognize. There were hundreds of unpublished images taken in New Mexico, Arizona, Colorado, and Utah from 1939 to 1962. This 1985 book, the only one devoted to Porter’s black and white work, consists of a selection of 90 of those images, covering an unexpectedly large range of subjects. 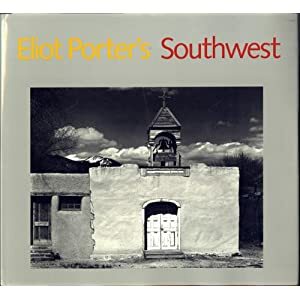 The book was published in 1987 on the occasion of Porter’s first major retrospective at the Amon Carter museum, to which Porter would later bequeath his entire work, which is available to view at the extensive Eliot Porter online collection guide. It opens with a 75-page autobiographical memoir which ranges from his early years, move to Santa Fe, work with the Sierra Club, to his later exotic travels. Porter remembers a pivotal encounter early in his career: “The other photographer turned out to be Ansel Adams, of whom I had never heard… After dinner, I was asked to show my pictures, which I did with a certain amount of self-satisfaction. Ansel Adams looked at them but said nothing, and then showed his. That was a traumatic and embarrassing experience; I saw immediately how vastly superior his photographs were to mine, and how little I know about photography technically, or what its potential was for creative expression … Sensing my embarrassment, Ansel Adams tried to encourage me, suggesting that my photography could be improved by using a larger format camera.” The memoir concludes with an epilogue: “But before all else a work of art is the creation of love. Love for the subject first and for the medium second. Love is the fundamental necessity underlying the need to create, underlying the emotion that gives it form, and from which grows the unfinished product that is presented to the world. Love is the general criterion by which the rare photograph is judged. It must contain it to be not less than the best of which the photographer is capable”. The plate section presents a selection from all his projects, including not only color natural landscapes, but also early black and white work and bird photographs, and later foreign cultural work, which even includes a few portraits. Excellent reproductions and design (also by Eleanor Morris Caponigro) make it the best introduction to Porter’s work. The most comprehensive survey of Porter’s work to date, published in 2001 as a catalog to the centenial exhibition, using the same large trim as “In Wildness”. Although there are plenty of autobiographical essays in Porter’s books, not too many critical essays were available in previous books. “The color of Wildness” include two interesting ones: John Rohrbach addresses Porter’s innovations in photography compared to photographers such as Ansel Adams, while Rebecca Solnit explores its environmental influence. In addition, his son Jonathan memoir discusses Porter’s lifelong love of the natural world, his working methods, and his interests outside of photography. Since this is a relatively recent book, I would have expected excellent reproduction. While most plates are fine, some do suffer from excessive contrast, resulting in blocked shadows. Although Porter used a large format camera, he made small, gem-like dye transfer prints, whose richness is very difficult to reproduce by ink. Maybe the best reproductions so far are in Regarding the Land: Robert Glenn Ketchum and the Legacy of Eliot Porter, which as indicated by the title, is more about RGK than Porter. 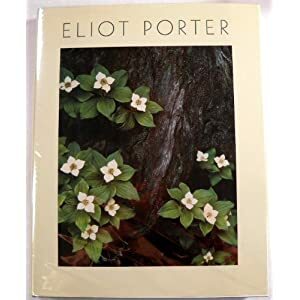 I have a half-dozen more books by Eliot Porter on my shelves – of uneven quality I must say – but those are either my favorites (for a variety of reasons), or books that shed a particular light on Porter’s work. Did any other book inspire you ? Posted on September 12, 2012, 11:12 am, by QT Luong, under Books. Great collection, QT. I have In Wildness and Nature’s Chaos. Richard, that’s also the first two I bought. His first and last. What’s next for you ? Wow, thanks so much for an excellent essay and comments on Porter. I did not realize he had so much work and had such impact. Thank you very much, I have ordered several of the books you have mentioned. The work of Eliot Porter was admired by a tremendous and wide audience including most young photographers and my father pioneer landscape photographer Philip Hyde. My father, though 20 years Porter’s junior, introduced color landscape photography to the world the same year, in 1962 with the Sierra Club book “Island In Time: The Point Reyes Peninsula,” which was a somewhat rushed, more documentary project not in the Exhibit Format Series. “In Wildness” was a well-planned art book with beautiful color throughout. “Island In Time” helped raise the funds necessary to purchase the land to make Point Reyes National Seashore. Because Porter’s book had the limelight and was far more widely promoted, Porter in the past has taken most of the credit for introducing color to landscape photography, but that seems to be shifting some and rightly so. I would disagree with your statement that Porter was to color landscape photography what Ansel Adams was to black and white. I realize this has been said before. Nonetheless, my father’s work has more often been compared to Ansel’s. He certainly more accurately fits the description of “the color Ansel Adams,” if that is a worthwhile description at all, based on his style and on the purpose and intent of his work and following of photographers who looked to Dad as “the” example for composition of the natural scene. Porter’s work was more obscure, more intimate, certainly some of the best ever made, but not as much the basis of what we see in the genre today. Those who represent Porter have long tried to pretend that Philip Hyde does not even exist. They have also made all sorts of exaggerated claims for Porter and his work, many of which were accomplishments of my father. My job has been and will continue to be to set the record straight. John Rohrbach, who is generally an excellent scholar and friendly gentleman from the Amon Carter Museum, wrote a book called, “Regarding the Land: Robert Glenn Ketchum and the Legacy of Eliot Porter,” a blatant promotion of both Porter and Ketchum wherein he makes many overblown claims for both. He states that Porter saved the Grand Canyon, which from a photography standpoint has always been attributed to my father for a number of obvious reasons including that Dad had 34 photographs in the flagship book for the campaign, “Time and The River Flowing: Grand Canyon,” three times as many as any other photographer in the book, while Porter only had two; besides Dad did three books on the Grand Canyon. Rohrbach also claimed that Ketchum was the quintessential photographer carrying on the legacy of Porter and color landscape photography in defense of wilderness. This may be more true today now that my father is gone, but in the 1990s when “Regarding the Land” was published, my father was the greatest force ever defending wilderness with photography. He was the parent and the heir apparent both. While there is no doubt as to the exquisite high quality of Ketchum’s work, Rohrbach’s claim was that in the 1990s Ketchum was the obvious dominant defender of wilderness with color photography in the tradition of Eliot Porter and the photographer that Porter favored himself because of their relationship. However, when Porter’s health was failing in 1998 before a prominent color landscape workshop, he called on Hyde to replace him. Why didn’t Porter bring in Ketchum as replacement, if Ketchum was the quintessential color landscape photographer? The stories and exaggerations go on… meanwhile I am working to document and carefully footnote, research, substantiate and solidify history as most would agree it happened. Other than that statement, echoing other’s innacuracies, you have done a superb job of chronicling the life’s work of one of the greatest photographers to ever live. Thanks David for your interesting comments. I stand by the statement, though. When I wrote that Porter was to color photography what Ansel Adams wasto black and white, I did not mean that he was the “color Ansel Adams”, but rather the “Ansel Adams of color photography” – a photographer of similar stature. I agree with you that Philip Hyde’s style is closer to Adams, but the difference of style of Porter is precisely what sets him apart as an artist of equal importance to Adams. Adams and Porter were almost exact contemporaries with strikingly parallel lives. Both discovered photography in their early tens, and while in their their early 30s, had prints exhibited by Alfred Stieglitz, which helped launch careers. Both devised pioneering darkroom techniques to make prints of great quality and expressiveness that advanced their medium – which both struggled to establish as an art form. Both served as Sierra Club board members. On the other hand, the fact that “In Wildness” and “Island in Time” were published in the same year 1962 does not mean that Hyde’s and Porter’s work were contemporary at all. It took 20 years for Porter to find a publisher willing to produce an art book, because the costs were so high, but when Porter was starting the project that would eventually lead to the publication of “In Wildness”, in the 1940s, Hyde had not even gone to photography school yet. 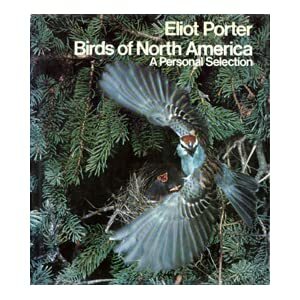 At that time, Porter already had an exhibit of color photographs (birds) at the Museum of Modern Art, NY. Even without taking into account the precedence of Porter – which alone would justify the credit he is given – it is not because “In Wildness” was “was far more widely promoted” than “Island in Time” that it established Porter as the pioneer of color nature photography. Like you wrote, “Island in Time” was produced for an activist purpose, and was successful in achieving its goal. However, compare the 72 full-page plates of “In Wildness” and the 8 pages of color photographs in “Island in Time” (1962 – I know that some stronger images were added to the reprint) and tell me if you consider them to be equivalent artistic accomplishments. People admired the book because of Porter’s vision. Color nature photographs were not “introduced to the world in 1962”. As early as 1944, Arizona Highways Magazine had published portfolios of color landscape photographs of Josef Muench (another forgotten name). You seem to imply that there is a conscious effort by Porter’s representatives to minimize Hyde’s significance. I am wondering why you think this would be the case ? You mention “Regarding the land” as a case in point. I don’t own the book, so I cannot verify for sure, but from reading it cover to cover I remembered it was published around the mid 2000s, not the 1990s. By that time Philip Hyde was no longer an active photographer – he lost his eyesight in 2000 – (or even alive ? ), which makes Rohrbach’s view of RGK as heir to Porter more plausibe. Speaking of RGK, maybe he provides the answer as he explained that he chose to exclude Hyde’s images (although Cahn’s text has two paragraphs about him) from the 1981 exhibit and catalog “American Photographers and The National Parks” that he curated for the National Parks Foundation because he perceived Hyde’s focus as being publications rather then prints. My father was also already photographing in color in 1944. I have color photographs of his of excellent artistic quality from 1942. When Ansel started what is widely recognized as the first photography school to teach creative photography as a profession, my father was instrumental in raising enough interest for a color class to be offered in 1949. Though he was 20 years younger than Porter, my father took just as many actions to pioneer color photography. Josef Muench and others photographed landscapes in color before either Hyde or Porter, but Hyde and Porter were those who became most widely known for color landscape photography through the Exhibit Format Series. They popularized color landscape photography, which in that sense I suppose Porter wins because his one book that introduced color was more popular. My point is that my father, and perhaps a few other photographers, deserve to share the credit, not take the credit away from Porter. My father already shares the credit, but is sometimes forgotten, as are the lesser names in most accomplishments. Your mention also raises the question, in 1944, was Arizona Highways publishing creative photography, or landscape photography as we know it at all? Have they ever published what you could call photographic art? It could be argued both ways. There are certainly some gray areas as to what is art and what is documentary. For my father, who had training and influence from the definers of both, i.e. Edward Weston and Dorothea Lange, the lines were definitely blurred. I have said that Island In Time was a more documentary project, but it was certainly artistic as well and it was most definitely landscape photography. As to the claim that Porter’s style was more distinct from Ansel’s than Hyde’s, that is a matter of opinion. My point was not that Dad’s style was similar to Ansel’s, but that his work was more often compared to Ansel’s, a significant difference. The only reason my father’s style is ever considered similar to Ansel’s is that he also photographed the big scenes, unlike Porter. However, my father was most known for the mid-sized scene, or mid-scope, mid-distance photograph, though he too explored intimate details and close-ups. He was recognized for this back in photography school, 1947-1950, as a departure from what Ansel did. Nonetheless, you do see in my father’s work some influence of the masters before him such as Edward Weston and even Porter. This does not mean his work was derivative or somehow less unique than Porter’s. It has been argued that Porter did not even have a distinct style, whereas my father most definitely did. Porter’s work was very inconsistent. He photographed birds in flight, close-ups, reflections and all sorts of other widely diverse types of images. I believe the photographing of reflections in the Canyons of the Southwest by both Hyde and Porter was a product more of those reflections being the most eye-arresting and beautiful aspects of those canyons, rather than of any particular development of style. The fact that Porter photographed close-ups more than most other landscape artists, does not define a style. Still, even without a “style,” which is the catch-all buzz word of the day today, Porter’s work had an incredible haunting and moving quality that cannot be denied or diminished. My father’s work too, had many unique aspects that nobody else did before him and a certain spiritual quality of the light and composition that many have expressed and emulated. If you take a poll of the who’s who of professional working landscape photographers, you will find that most of them were influenced by both Hyde and Porter, but that they most emulate Hyde’s compositions as the first of their kind. Did Cahn state this specifically? If so, he is at least partially incorrect. It was well-known and still is today that Dad was a very prolific and highly talented printer, in those days it was mainly in black and white silver prints. The only reason I can imagine Cahn would think something along the above lines is that Dad was so widely published in those days that his photographs were “everywhere.” Also, Dad always operated on a shoestring. For the most part, he only printed 2-8 prints of each image, whether black and white or color, whereas, Porter, who was always well-funded having the savings of a long MD practice and having married into money just as Ansel did, printed 200 prints of each of his portfolio images. This is one reason, among others, why his prints have not held value in the market as well as the black and white photographers. My father became a known master of color dye transfer printing, but it wasn’t until the 1970s, which perhaps in hindsight today could be construed to mean that he was not as much of a master printer or pioneer as Porter. We’ve talked about this and no, you’re partly right, color did not necessarily first appear in landscape photographs in 1962, depending on your definitions. However, it was not Eliot Porter who brought color into the forefront in landscape photography, but David Brower and the Sierra Club publishing program that established it’s prominence in the genre, much to Ansel’s chagrin, I might add. Certainly the success of “In Wildness” influenced the decision to go primarily with color from then on in the books, but there were many books that continued to succeed in color in rapid succession shortly after “In Wildness” and “Island In Time.” The Exhibit Format Series became a publishing phenomenon, not because of the success of “In Wildness” or Porter, but because of the success of color to strike a chord and move people to save wilderness. It still remains that my father was young, eager, hungry and available on short notice and thus became the workhorse of the publishing program. Ansel, Nancy Newhall and David Brower started the series, but Ansel alone does not deserve the credit for the series success, nor does Porter alone or my father. I refer to 1962 as the year it all began because that was the year that the first books in the program came out in color. I have a copy of “Regarding the Land” in Colorado. I’ll have to check the original publishing date. Amazon says 2006, but I think the original date was earlier. My father’s eyesight began to fade in 1999 and he made his last photograph in September 2000, as far as I have been able to discover. He remained active in publishing and defending wilderness up to and beyond his death in 2006. The book, “Ghosts of Glen Canyon” was published in 2009. My statements about his prominence in the 1990’s still stand and influence the context of any book released in the early years of the new Millennium. David, thank you for the clarifications. The statement that images from Hyde were excluded from the exhibit and catalog because his focus was on publications rather than prints (which he clarifies as not meaning that Hyde did not make prints) is from the exhibit’s curator, Robert Glenn Ketchum. The other noted photographer excluded for the same reason was Ersnt Haas. “In Wildness” was Porter’s project. He approached the Sierra Club, not the opposite, so it is fair to speculate that without him, the exhibit series books (of which “Island in time” wasn’t one) may have remained B&W. It is also possible that if “In Wildness” hadn’t been so successful, they would have reverted to B&W. I can see why Adams wasn’t happy: Brower had him contribute his own color images – which he never considered to be “creative”. As an aside, Porter never had a MD practice – I doubt that his occupation as a research scientist was very lucrative – however he benefited from a family trust fund which gave him financial independence. Just like Eggleston, coincidence ? Ketchum was mostly wrong and clearly biased toward promoting himself over other defenders of wilderness with color photography. Thank you for the clarifications about Porter. I don’t know a great deal about the details of his life. I knew he was a doctor, that’s all. I didn’t know he had no practice. Where did you read about Porter’s life? It would probably be wise for me to read up. I know a little more about the Sierra Club publishing committee, but not everything there either. I have talked quite a bit, though not in extensive detail yet, with Ken Brower about those early decisions because he was involved as David Brower’s son and as editor of a number of the books. According to Martin Litton, who was also on the Publishing Committee, it was not only the success of “In Wildness” that shifted the program into color. Color was the hot new thing and the books were selling well, not just “In Wildness.” You may recall from your research that in the early 1960s the series was in high gear and a number of the color books came out in rapid succession. At one point around the time I was born in 1965 and a little before, there were half a dozen nationally significant campaigns going on at once. Dad was one of the few, if not the only prominent nature photographer of the time who worked and supported himself for over 60 years full-time in the medium without some kind of bankroll, which in and of itself is a significant accomplishment. Just ask anyone, as you know, who has tried being a full-time photographer during any era, even today, where the market is well-established. Wrong about what ? As for self-promo, I cannot dispute that, since he included himself in the exhibit. I read about Porter’s life in the books listed in this page. Several of them, particularly the 1987 retrospective, have a strong autobiographical component. Wrong about excluding Hyde and Haas. Wrong in his motives for doing so. Wrong in his purported surface reason for doing so as well. I am not sure it is a superficial point. If one wants to be recognized as an artist by some circles, they need to put forward and exhibit artworks. Porter became a full-time photographer only after the validation provided by the Stieglitz showing. RGK understood that well since he had an MFA (unlike other prominent nature photographers). Presentation (in his case, at large scale) was an integral part of the effect of some of his series, and a differentiator from Porter. Photobooks have more recently been recognized as an artistic medium, but not all books which include photography qualify as such. What an excellent survey of Porter books! And an interesting discussion with David Hyde above. I really appreciate your blog, one of the best photography blogs around. I just finished reading his retrospective, “Eliot Porter”. I have a whole new appreciation for his body of work, and the printing is much better than my original copy of “In Wildness”. His bird photography is especially impressive, not only for being able to pull it off, but they look great as well. You don’t see that style being applied to bird photos these days. I’d like to get his bird book now, as I see there are a number of them on Amazon for cheap. Hi – I collect Eliot Porter books and was glad to find your site. Last time I looked at the Wiki page for Eliot Porter, it, sadly, was practically barren. I would love to add to it, but the process has confounded me everytime I even think I might try updating, and I certainly don’t have the knowledge you do. So, I’m suggesting you consider updating that page. It just seems a shame that so many people aren’t being fully informed of how amazing Eliot Porter is! He is my favorite photographer. I got a chance to see some original prints kept in archives at the Etheridge Gallery in Tucson in 2007. It was pretty cool.